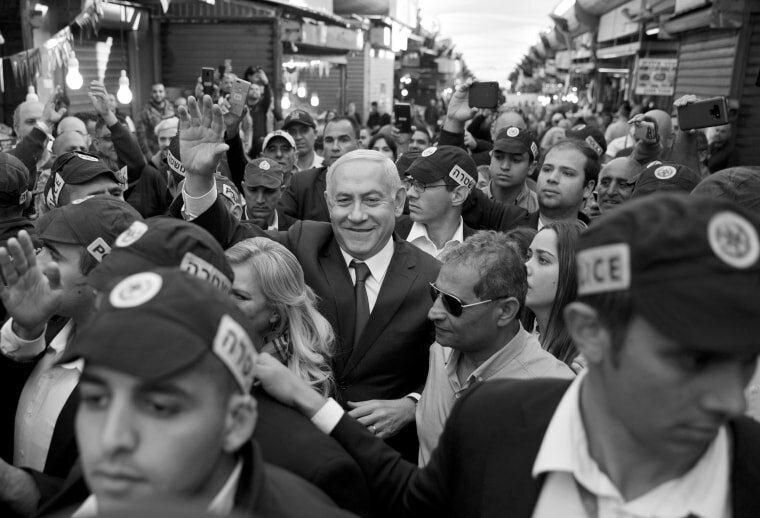 Daniel B. Shapiro: 2019 Israeli elections are a referendum on Benjamin Netanyahu. Which vision of Bibi will prevail? Daniel B. Shapiro 2019 Israeli elections are a referendum on Benjamin Netanyahu. Which vision of Bibi will prevail? As Israelis prepare to go to the polls this week to choose their next Knesset (parliament), it is striking what this election is, and what it is decidedly not, about. No, the election is about one thing, and one thing only: Prime Minister Benjamin (Bibi) Netanyahu. To be more precise, it is a race between two competing perspectives: Those who have Bibi fatigue, and those who see Netanyahu as indispensable to the security and prosperity of the nation. It is striking what this election is, and what it is decidedly not, about. Adherents of each camp make strong arguments to support their view. The prime minister’s defenders list numerous achievements they credit to him since he returned to office in 2009. Despite security challenges in every direction, Israelis have rarely felt safer at home. Israel has successfully prevented the Syrian civil war from spilling over into its borders, deterred Hezbollah from launching a new war while exposing and destroying tunnels they dug under the northern border and attacked Iranian armaments and personnel in Syria. Elsewhere, Netanyahu has scored meaningful diplomatic wins. His relationship with the mercurial U.S. President Donald Trump has spared Israel any pressure on the Palestinian issue, encouraged the U.S. withdrawal from the hated Iran nuclear deal, and last month, secured U.S. recognition of Israeli sovereignty in the Golan Heights, which Israel captured from Syria in the 1967 war. Netanyahu’s skillful dialogue with Russian President Vladimir Putin is even more impressive: it has guaranteed Israel’s freedom of action to strike at Iranian targets in Syria, and led, with Russian help, the recent return of the body of an Israeli soldier killed in a battle in Lebanon in 1982. Israel is finding other new doors opening. Arab and Muslim states like Oman and Chad, who once eschewed formal ties have hosted Netanyahu. Israel is working with African nations eager for Israeli technology and making common cause with Eastern and Central European nationalist regimes. Meanwhile, Israel’s flourishing as a hi-tech center of innovation has blossomed on the prime minister’s watch. Who else but someone of Netanyahu’s experience, the prime minister’s supporters ask, could achieve so much for the state under such challenging conditions? Why put the country’s fate in the hands of a rookie when there are so many complex issues to confront? But the prime minister’s critics have a compelling case of their own. His challengers in the Blue and White party — a newly created union of two centrist parties led by former IDF chief of staff Benny Gantz and former finance minister Yair Lapid — critique not his policies, but his character and style of leadership. They cite the divisiveness of Netanyahu’s politics, which feature all-out demonization of his opponents as leftist weaklings who would put Israel in danger, and alienation of Israel’s Arab minority. This scorched earth strategy has never been more evident than during this campaign itself. They point to his legal challenges. The attorney general, Avichai Mandelblit, a Netanyahu appointee, announced in February his intention to indict the prime minister on counts of bribery, fraud, and breach of trust, following a multi-year investigation. Netanyahu calls the probe a politically motivated witch hunt, but the image of a long-serving leader who lost track of ethical boundaries has shaken him. Enough already, Israelis of this camp argue. The country is tired from the Netanyahu melodramas and seeks the fresh air provided by a change of leadership. Bibi fatigue is a not new, and Netanyahu has overcome it before. But what makes him more vulnerable this year than in past elections, besides more years and a longer trail of controversies, is an opponent who can puncture the notion of his indispensability. Gantz and Lapid, joined by two other former generals, Moshe Yaalon and Gabi Ashkenazi, are trying something new. In a country whose politics have shifted rightward, they are running as a right-of-center, security-minded, clean-government alternative. While Gantz and Lapid do not rule out a two-state solution someday, the views of Yaalon and two former Netanyahu aides on the Blue and White list — Yoaz Hendel and Tzvi Hauser — who openly reject a Palestinian state, are front and center. Meanwhile, the generals’ security credentials offer a plausible argument that they, too, could keep the country safe. As a party, they contrast themselves to Netanyahu stylistically, talking the language of national unity and rooting out corruption. The Blue and White campaign slogan — “Israel Above All” — seeks to draw a contrast between soldiers who sacrifice for the country, and a leader who puts his own needs first. In closing polls, Blue and White leads Netanyahu’s Likud party in Knesset seats, 30-26. But after the election, both parties will scramble to form a coalition of at least 61 seats in the 120-seat Knesset. In that battle, Netanyahu has the edge in potential partners, with several smaller right-wing parties likely to join him. But he is leaving nothing to chance. Fearful of trailing Blue and White on the morning after the election, Netanyahu promised this weekend to begin annexing portions of the West Bank, where Israel has established settlements, but which Palestinians claim for their future state. He has long resisted the move, which could bury prospects for a two-state solution and draw major international blowback. But his political needs have led him to play this card. It’s a move calculated to portray his indispensability to the country’s growing share of right-wing voters. A recent poll by the Israeli newspaper Haaretz showed support for annexation at an all-time high of 42 percent, with support for two-states dropping to to a new low of 34 percent. But the same promise — a dramatic political reversal, of dubious durability, on a critical issue in his moment of political and legal peril — reinforces some of what Israelis find so exhausting about the man who has dominated Israeli politics for over a decade. On Tuesday, Israelis will decide which version of Netanyahu prevails.